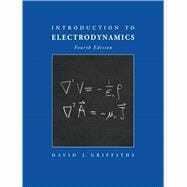 For junior/senior-level electricity and magnetism courses.This book is known for its clear, concise, and accessible coverage of standard topics in a logical and pedagogically sound order. The highly polished Fourth Editionfeatures a clear, accessible treatment of the fundamentals of electromagnetic theory, providing a sound platform for the exploration of related applications (ac circuits, antennas, transmission lines, plasmas, optics, etc.). Its lean and focused approach employs numerous new examples and problems. David Griffiths received his BA and PhD from Harvard University. He held post-doctoral positions at the University of Utah and the University of Massachusetts (Amherst), and taught at Hampshire College, Mount Holyoke College, and Trinity College (Hartford) before joining the faculty at Reed College, where he has taught for over 30 years. In 2001-2002 he was visiting Professor of Physics at the Five Colleges (UMass, Amherst, Mount Holyoke, Smith, and Hampshire), and in the spring of 2007 he taught electrodynamics at Stanford. Griffiths is a Consulting Editor of The American Journal of Physics, and a Fellow of the American Physical Society. In 1997 he was awarded the Millikan Medal by the American Association of Physics Teachers. He has spent sabbaticals at SLAC, Lawrence Berkeley Laboratory, and UC Berkeley. Although his PhD was in elementary particle theory, his recent research is in electrodynamics and quantum mechanics. He is the author of forty-five papers and three books: Introduction to Electrodynamics (Fourth Edition, Prentice Hall, 2013), Introduction to Elementary Particles (Second Edition, Wiley-VCH, 2008), and Introduction to Quantum Mechanics (Second Edition, Prentice Hall, 2005).